Corbert Buddy Gomez III obituary. Carnes Funeral Home. 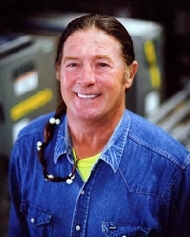 Corbert J. (Buddy) Gomez, III, 60, went into pain-free Peace on February 25, 2016 with his wife, children and grandchildren at his side after a courageous, unrelenting battle with lung cancer. We celebrate his kind and vivacious life in fond memory. He resided in Dickinson, Texas with his loving wife, Janice, and his in- laws, Gene and Joyce Stansbury. He had lived his youthful years in Jacksonville, Florida. Buddy was a loving husband, father, father-in law, brother, brother-in-law, son-in-law, grandfather, great story teller, true lifetime friend who knew few strangers, and a self-proclaimed amateur political consultant. He cheerfully offered his opinion about anything to anyone who would listen. His unparalleled skills in commercial air conditioning construction, as well as anything that needed fixing, will remain forever legendary. He was predeceased by his mother, Ellen Gomez; father, Corbert J. Gomez, Jr.; sister, Katie Jo Cooper; brother, James Preston Gomez, Sr. and great grandchild, Nicole Rayann. He is survived by his beloved wife of 40 years, Janice Gomez; daughter, Gina de Forrest (Virgil); son, Corbert J. Gomez, IV (Rita); daughter, Liberty Baugh (Isaiah); grandchildren: Madelynne, Tara, Virgil, Jr., Mallory, Rachel, Josh, Jeremy, Hope, Faith, Aubrianna, Tristen, Brayden and 9 great grandchildren; sister, Linda Bartley (widowed); sister, Julie Dekker (Randy); sister, Tina Neff (Richard) and many nieces and nephews. Memorial services honoring Buddy will be held April 2nd, 2016, at 11:00 am to 12:00 (noon) for visitation with the service from 12:00 (noon) to 1:00 pm and the fellowship time is to be announced later. In lieu of flowers, memorial contributions may be made to the American Cancer Society and/or to your local hospice.